I CAME TO DR. AYZIN OFFICE HAVING VERY SERIOUS PROBLEMS WITH MY TEETH AND GUMS. ALONG WITH THESE PROBLEMS I HAD AN OVERWHELMING SENSE OF TREPIDATION IN REGARGDS TO ANY SORT OF DENTAL PROCEDURES AND THE HOPE THAT HE WOULD BE ABLE TO HELP ME REGAIN THE CONFINDENCE TO ACTUALLY SMILE IN PUBLIC AGAIN. ATFER NEARLY TWO DECADES OF NEGLECTING MY TEETH I WASN’T SURE THAT I COULD EVER REACH THAT POINT AGAIN. 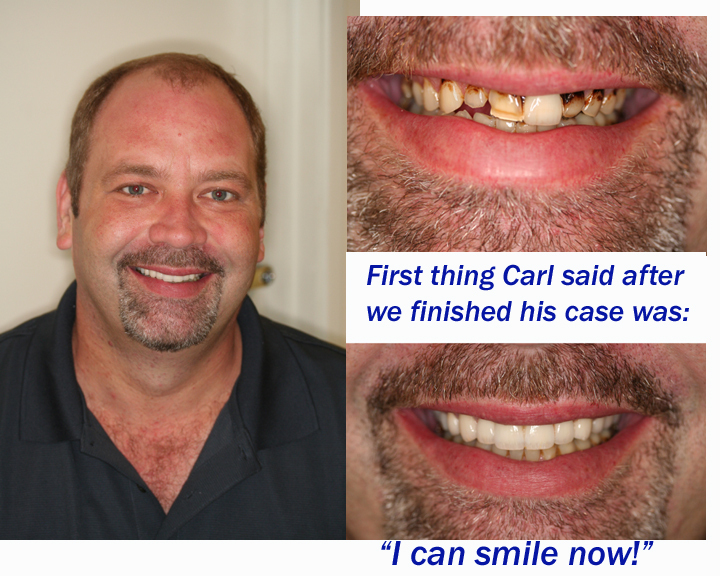 THANKS TO DR. AYZIN AND HIS ENTIRE STAFF I AM ABLE TO SMILE AND TALK WITH ANYONE WITHOUT SEEING THE LOOKS AND REACTIONS THAT CAME ALONG WITH THE NEGLECT I HAD SHOWN MY TEETH. EVERYONE AT DR. AYZIN’S OFFICE MADE ME FEEL QUITE AT EASE AND GAVE ME A SENSE OF CONFIDENCE THAT I HAD CHOSEN THE RIGHT DENTAL PRACTICE TO HAVE THE WORK DONE. I WOULD LIKE TO THANK CRYSTAL WHOSE KINDNESS AND PROFESSIONALISM DID WONDERS TO ALLEVIATE THE FEAR I FELT WHEN IT CAME TO HAVING TO SPEND EVEN ONE MOMENT IN A DENSTIST CHAIR. ALSO I EXTEND MY GRATITUDE TO BOTH JENNIFER AND INNA FOR BEING SO HELPFUL AND ANSWERING ALL OF MY QUSETIONS NO MATTER HOW INNANE THEY MAY HAVE BEEN. LAST AND CERTAINLY NOT LEAST I NEED TO THANK DR. AYZIN FOR THE METICULOUS WORK AND THE AMAZING RESULTS. HIS WORK HAS EXCEEDED ALL THE EXPECTATIONS I HAD GOING INTO THIS SITUATION. 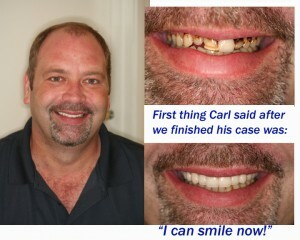 I TRULY COULD NOT BE HAPPIER WITH THE CHOICE I MADE TO HAVE THE WORK PERFORMED AT DR. AYZIN’S PRACTICE.